The Oklahoma Hospital Association estimates that half of rural to mid-sized hospitals in Oklahoma are in danger of shuttering. On Election Day, voters in three traditionally Republican-led states will decide whether or not to expand Medicaid, the government health insurance program for the poor and people with disabilities. Before the Affordable Care Act, Medicaid was reserved mainly for pregnant women, poor children, low-income seniors and people with disabilities. With the ACA came the requirement for states to expand access to Medicaid to childless adults whose incomes are less than 138 percent of the federal poverty level, which is $12,140 for individuals. A U.S. Supreme Court ruling in 2012 made the expansion optional for states. After that decision, Oklahoma Gov. Mary Fallin declined federal funds that would have footed the bill for Medicaid expansion. Fast-forward five years and Idaho, Nebraska, and Utah have changed their tune and could join the 33 states and Washington, D.C., that have expanded Medicaid. Idaho Gov. Butch Otter, a Republican, endorsed the expansion initiative Tuesday. In Montana, voters are set to decide whether to approve a tobacco tax to continue that state’s Medicaid expansion or let it roll back next year. NPR reports that the campaign to get Medicaid expansion onto the ballot in Utah and the three other states have been led by The Fairness Project, a nonprofit advocacy group that pushed for ballot measures on issues where they feel lawmakers are out of sync with citizens. The group is funded by the SEIU United Healthcare Workers West, a California health care workers union. As more GOP-led states with vast rural areas consider Medicaid expansion, supporters in Oklahoma are watching. They say it’s the best solution to make sure rural hospitals survive. “Because other states have found ways to accept these federal funds, they are moving forward, their hospitals are in better shape because of it,” said Patti Davis, director of the Oklahoma Hospital Association. Oklahoma’s rural hospitals are in trouble: Four have closed in the past eight years,and the hospital association estimates that half of rural to mid-sized hospitals in the state are in danger of shuttering. Pauls Valley Regional Medical Centergrabbed headlines for its recent closure. It’s a perfect storm for Oklahoma hospitals, Davis said. “You’ve got Medicare cuts, then you’ve got a decision not to expand Medicaid, then you’ve got state budget cuts,” she said. Oklahoma has the second-highest uninsured rate in the nation — a major financial strain on hospitals. Joan Alker, a researcher at Georgetown University who studies health policy, said the number of people without health insurance is even higher in rural areas. Rural places tend to be poorer and have higher rates of unemployment and disability — all factors linked to Medicaid eligibility. “You know when there’s that many uninsured folks, it exposes them to medical debt and bankruptcy and exposes the hospitals and clinics that see them to a lot of bad debt,” Alker said. Hospitals are legally required to provide emergency care. In areas where most people don’t have health insurance, that leads to more uncompensated care — services provided by hospitals or health care providers that don’t get reimbursed. That eats into the hospital’s bottom line. Oklahoma has the second-highest uninsured rate in the nation — a major financial strain on rural hospitals. 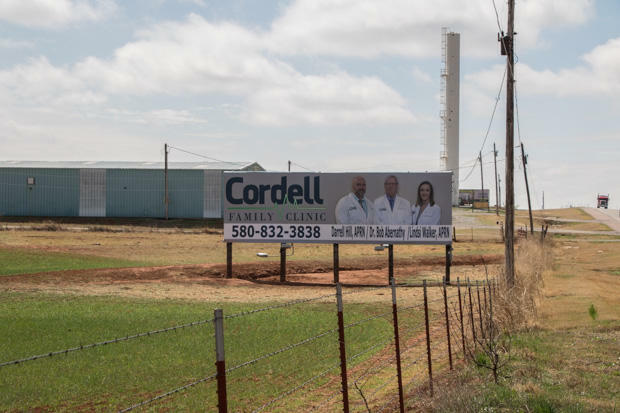 This billboard advertises a hospital in Cordell, Oklahoma. The effect of Medicaid expansion on hospital survival is dramatic. University of Colorado professor Richard Lindrooth found that the probability that a hospital would close was reduced by more than 81 percent if a state expanded Medicaid. “We performed a more rigorous analysis and controlled for things like local market conditions such as unemployment rate, median income and also hospital characteristics to see if the increased probability of closure in states that did not expand Medicaid remain — and it did,” he said. Rural residents are worried about their local hospitals — and they’re paying attention. At a recent political forum sponsored by Together Oklahoma and Oklahoma Watch in Lawton, all the candidates in attendance — Republican and Democrat — supported Medicaid expansion. About 250,000 people would have access to health insurance if Medicaid were expanded in Oklahoma, but it comes with an estimated $100 million price tag, which critics say the state can’t afford. The federal government would cover at least 90 percent of the cost. Davis with the Oklahoma Hospital Association says another option is better funding for Insure Oklahoma, a state and federal program that subsidizes the cost of health insurance for low-income workers, many of whom fall in a coverage gap. “If we accepted federal funds and put them in Insure Oklahoma, they [low-income workers] would qualify for a subsidy to help purchase their premium and then it would be affordable to them,” Davis said. Another change to Medicaid may be on the horizon. This fall, the Oklahoma Health Care Authority will apply for a federal waiver to impose work requirements on some Medicaid recipients. The federal government has clawed back another $32 million in Medicaid matching funds as part of an ongoing dispute over Oklahoma’s use of the money to help fund medical schools that treat Medicaid patients. The Centers for Medicaid and Medicare Services notified state officials Aug. 31 that it disallowed a total of $64.2 million in federal matching funds for the 2017 calendar year. The total includes almost $33 million that was previously disallowed. A state budget crunch could lead to less money for health care providers in Oklahoma. Oklahoma’s state Medicaid agency may cut Medicaid reimbursements rates by up to 25 percent to make up for a state budget shortfall of almost $900 million. Preston Doerflinger, the state’s budget director, has asked the Oklahoma Health Care Authority to prepare for a possible 15 percent reduction in state appropriations. This means that companies providing services to Medicaid patients might not be fully reimbursed by the government.